The P-51H (NA-126) was the final production Mustang, embodying the experience gained in the development of the XP-51F and XP-51G aircraft. This aircraft, with minor differences as the NA-129, came too late to participate in World War II, but it brought the development of the Mustang to a peak as one of the fastest production piston engine fighters to see service. The P-51H used the new V-1650-9 engine, a version of the Merlin that included Simmons automatic supercharger boost control with water injection, allowing War Emergency Power as high as 2218 hp (1,500 kW). Differences between the P-51D included lengthening the fuselage and increasing the height of the tailfin, which greatly reduced the tendency to yaw. The canopy resembled the P-51D style, over a somewhat raised pilot's position. Service access to the guns and ammunition was also improved. With the new airframe several hundred pounds lighter, the extra power and a more streamlined radiator, the P-51H was among the fastest propeller fighters ever, able to reach 487 mph (784 km/h or Mach 0.74) at 25,000 ft (7,600 m). Additional orders, already on the books, were cancelled. With the cutback in production, the variants of the P-51H with different versions of the Merlin engine were produced in either limited numbers or terminated. These included the P-51L, similar to the P-51H but utilizing the 2270 horsepower V-1650-11 Merlin engine, which was never built; and its Dallas-built version, the P-51M or NA-124 which utilized the V-1650-9A Merlin engine lacking water injection and therefore rated for lower maximum power, of which one was built out of the original 1629 ordered, serial number 45-11743. Although some P-51Hs were issued to operational units, none saw combat in World War II, and in postwar service, most were issued to reserve units. One aircraft was provided to the RAF for testing and evaluation. Serial number 44-64192 was designated BuNo 09064 and used by the U.S. Navy to test transonic airfoil designs, then returned to the Air National Guard in 1952. The P-51H was not used for combat in the Korean War despite its improved handling characteristics, since the P-51D was available in much larger numbers and was a proven commodity. Many of the aerodynamic advances of the P-51 (including the laminar flow wing) were carried over to North American's next generation of jet-powered fighters, the Navy FJ Fury and Air Force F-86 Sabre. The wings, empennage and canopy of the first straight-winged variant of the Fury (the FJ-1) and the unbuilt preliminary prototypes of the P-86/F-86 strongly resembled those of the Mustang before the aircraft were modified with swept-wing designs. Today, a half dozen P-51H airframes are extant in museums and I believe one is flying as a warbird. 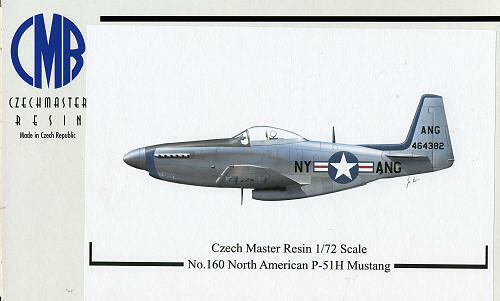 CMR has produced a kit that provides probably every possible option and variation of the P-51H that is possible. 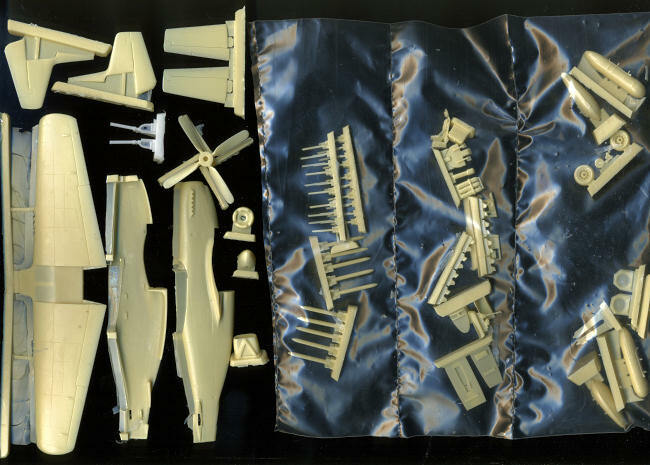 There are a lot of parts in this one, all superbly packaged separately in individual section, to prevent damage to the parts and to smaller bits. As you can see from the image of the bits, I've removed the major pieces and left most of the small bits in the segmented packaging to prevent loss. The detail level on the resin parts is superb as you might expect from CMR. Inspecting the various pieces, I notice no molding flaws or air bubbles, though there were a few areas where I could see them just under the surface of the resin.. CMR has provided us with injected plastic landing gear again, which helps to keep the weight of the model from causing them to sag. These look to be better formed than those on the Mars that was recently completed. A complete interior is provided with sidewall detailing and the proper radio and oxygen bottles(?) on the shelf behind the pilot. Of course, this stuff behind the pilot will be practically invisible with the closed canopy as there is a plate attached to the back c anopy section. However, CMR does provide two nicely molded vacuformed canopies so you can cut these to pose it open should you wish. A very nice photo etch fret done by Eduard and in color is provided. 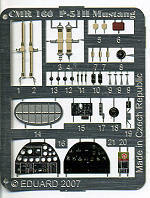 It give you instrument panels, harness cooler grilles and a number of other smaller items for use in the cockpit. CMR also provides a complete set of wheel and canopy masks (not shown as it would look like a solid yellow sheet). I appreciate these sorts of things being added to the kit as they just make things easier all the way around. For options, there are two fin types (one for a preproduction aircraft), as well as two drop tanks (and I'm really not sure if the 108 gallon paper ones are appropriate for the H model), and two different set-ups for the rocket armament. One is standard rocket stubs and the second includes rail sections in between the stubs for the use of practice rockets. I am thinking that few will use either rocket option as there are no definitive marks on the lower wing to show exactly where the stubs are to be placed. Same goes for the fuel tank rack locations. Personally, I'd like to see these provided as raised surfaces that we can then sand down if we are not going to use them. The instructions do include a pair of five views that show in the front view where the stubs go along the wing, and that will be quite handy for those who do wish to use these. Three of the eight pages prov ide construction drawings, one has the five view drawings and the other four pages are dedicated to markings. One can do seven different markings options, all of them in unpainted metal with OD anti-glare panels on the nose. The short tailed plane is from the NAA Flight test division with a red, white and blue spinner as its only non-standard marking. 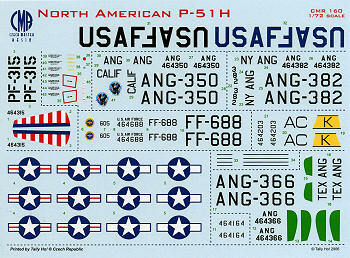 There are three ANG planes from the 139 FIS, NY ANG trimmed in blue, 194 FIS, California ANG trimmed in red and 181 FBS, Texas ANG, trimmed in green. There are decals for the Texas ANG trim with the other two requiring paint. The fifth option is for is a pre-USAF scheme with the 56th FG in 1946 with the pre-war rudder stripes. Another pre-USAF scheme is for the 57th FG in Alaska in 1957 with a yellow fin band. Finally, a 1403 Maintenance Squadron aircraft assigned to MATS at Andrews AFB in 1951. Decals are superbly done and printed by Tally Ho. As is often the case with European decals, I find the blue surround to the 'wings' of the insignia to be too thin. You'll notice that both the black and insignia blue USAF markings are provided. Obviously this kit does put all the other H model Mustangs to shame, and that includes those done in 1/48. If you are a Mustang fan, then this is a kit that you really must add to your collection. It will be a very long time before anything better comes along in any scale. My thanks to the North American importer of CMR kits, www.westcoasthobbys.com for providing the review kit.Order yours direct from the hyperlink and see what else is available from CMR.